Karma Dondrup Tashi wrote: What make4s a cup a valid cognition that can be non-affirmatively negated and a unicorn an invalid cognition that cannot be non-affirmatively negated? In order for something to be a valid cognition, it has to either be perceived or one must be able to validly infer its existence, such as when seeing smoke on a distant mountain top and inferring there must be fire there. I dunno about you, but I've never seen a unicorn, nor has anyone I know, and I've found nothing on which to infer their existence, so unicorns are not validly cognized. On the other hand, there's a cup right in front of me. If a unicorn is not a valid cognition then how can tantra work? Is Chenrezig a valid or invalid cognition? He is a valid cognition to all the masters that have perceived him, and to those of us that infer his validity through relying on our faith in those masters, valid scripture, and eventually our own experience. Also, ascribing reality to a unicorn is merely imagination and isn't rooted in anything deeper one can also discover within oneself, unlike Tantra, which is not just fantasy. Everything about the practice, particularly in HYT, is analogous to aspects of our true nature. The way Chenrezig (or any yidam) appears, such as how many faces & hands, his color, the garments and ornaments he wears, the implements he holds, etc is not some real, solid identity; it's skillful means. It's not at all like if you look for me and every time you find me, I look the same, I have the same haircut and facial hair, I'm dressed the same way, etc. In reality, the real Chenrezig is the Dharmakaya, which is identical to the Dharmakaya of one's own mind. From Chenrezig's Dharmakaya, which is beyond meeting and parting from our own, the myriad of appearances of the Sambhogakaya and Nirmanakaya appear unceasingly, unfolding according to beings' capacities and what will resonate with them. We simply focus on one of those Sambhogakaya appearances in our sadhana, because each one communicates the true nature equally thoroughly, so only one need to be chosen to focus on. Back to the meaning and purpose of the aspects of the Sambhogakaya appearances we meditate on in sadhanas, there are many HYT commentaries where the author explains what each garment, ornament, implement, face, limb, etc represents. 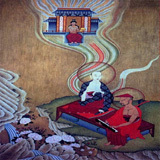 To give a merely general gloss of it, I'll say that the aspects of Chenrezig's appearance that I mentioned represent realization of certain enlightened qualities, strengths, and abilities, and the elimination of the afflictive emotions and veils of ignorance. Through practice, we can discover all this within our own minds. A TB master may take the image of a unicorn, dress it up up with robes and implements, four arms and three heads - and ascribe all manner of qualities to that image. As an object of Tantra in working on the mind, is there a difference between introducing a Chenrezig figure maybe 2,000 year ago, and introducing a unicorn now? Is there any physical evidence of the existence of either? If not, they are just as useful as Yidams. Chenrezig is not a valid cognition just because others have taught you that it is. Is there any way to refute that Chenrezig is as real as a unicorn, leaving aside the argument that 'my lineage believes it, so I do.? The reason given that a unicorn is not a valid cognition is "I haven't ever seen a unicorn". Can any of us TB practitioners really say "I have seen Chenrezig"? IMHO that can't really ever be said. There is always part of Chenrezig that remains skilful means no matter how great our devotion. Since this is so, Chenrezig, unicorns and cups all belong together in the same field and the initial problem remains - some things need not be non-affirmatively negated since they are already. Therefore non-affirmative negation or "lack of inherent existence" isn't even a good conceptual emptiness. Emptiness must apply not only to cups but also to unicorns and Chenrezig but if we use "lack of inherent existence" we can empty the former but not the latter - since they are already empty by this definition. Yeshe wrote: A TB master may take the image of a unicorn, dress it up up with robes and implements, four arms and three heads - and ascribe all manner of qualities to that image. As an object of Tantra in working on the mind, is there a difference between introducing a Chenrezig figure maybe 2,000 year ago, and introducing a unicorn now? Well, in the case of a buddha, like Chenrezig, we're talking about a former deluded sentient being who entered the Dharma, attained enlightenment, and then manifested in many forms to benefit beings; one of these forms is known to us as the four-armed, white buddha wearing silks and ornaments, etc. So it's not said to be some arbitrary image created by somebody. The practice carries great blessings and power by virtue of being a manifestation of enlightened mind to fulfill the task of guiding deluded beings to buddhahood, and we enjoy an interdependent link by virtue of the sadhana being practiced by many yogis from then to now, many of whom realized buddhahood through that path. I'm unaware of any buddha who manifested in the form of an enlightened unicorn and left behind such a lineage, however. Like I said, Chenrezig is a valid cognition to the masters that perceive him. For me, on the other hand, my own experience in investigating the nature of mind leads me to intuit the possibility of discovering Chenrezig's qualities in my own mind, so that informs my faith in the possibility and reality of buddhahood in general. Since whatever meditational glimpses and intuition I've experienced were due to practicing the methods passed down by the masters who've supposedly perceived and realized buddhas like Chenrezig, there's a basis for me to have faith in these masters' claims (or more usually what has been claimed on their behalf). In fact isn't it the case that, as to cups, unicorns and Chenrezig, their non-existence needs to be non-affirmatively negated as well as their existence? Therefore what I'm really asking for is an explanation of how "non-affirming negation" is related to "lack of inherent existence". The non-existence of cups, unicorns and Chenrezig also has no inherent "existence". So - there must be two difference uses of "existence" being used here. Karma Dondrup Tashi wrote: The reason given that a unicorn is not a valid cognition is "I haven't ever seen a unicorn". Can any of us TB practitioners really say "I have seen Chenrezig"? I've indulged in answering the question about whether Chenrezig is a valid cognition because it was a good and interesting question, however that question is truly a matter of faith and one's one meditative experiences. In truth, the arena for establishing valid or invalid cognition is ordinary conventional reality as ordinary beings perceive it. It is a sutric, not a tantric-level exercise, and is used to distinguish two types of things: (1) things that conventionally appear to exist but can't be found on the ultimate level and (2) things that don't even appear to exist conventionally. Two examples very often given of the latter are the son of a barren woman and the horns of a rabbit. The latter two things are clearly just ideas that don't correlate to things that can be found even conventionally. I believe the reason for making this distinction is to point out that Madhyamaka isn't positing the absolute non-existence of phenomena, only their ultimate existence, and that there's a world of difference between such conventionally existent phenomena and imaginary phenomena that don't exist in any way at all, even conventionally. So, a cup is different from a unicorn in that a cup is a valid cognition and thus can be found conventionally, though it is ultimately empty, while a unicorn can't even be found on the conventional level. Karma Dondrup Tashi wrote: In fact isn't it the case that, as to cups, unicorns and Chenrezig, their non-existence needs to be non-affirmatively negated as well as their existence? Non-affirming negation is just a via negativa argument, meaning it only negates what is false about a phenomenon, without following with any positive statements about it. I.E. one is saying what something is not without introducing something it supposedly is. If one were to give an affirmative-negation, then one might say "x is perceived to be such and such, but it is not. Instead, it's true nature is actually so on and so forth." Lack of inherent existence means that although validly cognized phenomena, such as cups, clearly appear in ordinary perception, upon analysis aimed at their ultimate nature, no single, solid, self-arisen and existing cup can be found. The argument would include the fact that things that are conventionally created and destroyed and rely upon causes and conditions to come about clearly have no single, solid, unborn and undying nature - no identity based on something indivisible - so they are merely dependently originated and simply appear. They are thus empty. OK, but here's the point - as to some objects, they are both ultimately and conventionally empty. As to others, they are ultimately empty but conventionally non-empty. It looks simple to me. When you say "I am speaking conventionally" you are pretty much saying "I am speaking about things without regard to emptiness doctrine, as if I knew nothing at all about it." So the phrase "conventionally empty" contradicts itself and makes no sense. "Conventionally non-empty" doesn't do much better. The logical form of the above argument is good, but the concepts the argument is manipulating contain the seeds of their own destruction. So, a unicorn is false and unreal to both Buddhas & Bodhisattvas, as well as Sentient Beings (ultimately and conventionally empty). But, a cup is false and unreal only to Buddhas & Bodhisattvas (ultimately empty), while true and real to Sentient Beings (conventionally non-empty). Buddhas & Bodhisattvas seeing both sides can speak in terms of either. Again a dilemma, whether or not to mention that I disagree. I will trust in in the goodwill of this forum which has been so evident lately. If your definition of emptiness is "false and unreal" and everything is empty, what is the difference between your definition and simply saying nothing exists? This is pure nihilism. If there is a difference, well, then something must exist. Things like cups, which we all perceive and use, exist conventionally. They are not absolutely non-existent like a hare's horns or the son of a barren woman or a unicorn. However, they cannot be found on the ultimate level because there is no single, unified thing with the essence of cupness to it. In order for it to be truly existing, which means indisputable even on the ultimate level, it would have to exist through its own power, it would have to be unchangeable, indestructible. But it's not, so it only conventionally exists. It isn't absolutely non-existent because we can perceive, use, and even make a cup. Every single time you validly perceive a cup and pick it up and fill it with water, it will perform the function of a cup. So, such dependently arisen phenomena are only ultimately false/unreal, not conventionally false/unreal. Nihilism would be to argue that phenomena don't even exist or function conventionally. This would of course defy our experience. We seem to have a difference of definitions here. To me, conventional existence means the perception that the cup HAS an essential inherent cup quality. Then, by negating part of that perception, we arrive at its ultimate nature. So the falseness resides in the conventional perception and needs to be removed in order to arrive at an ultimate cup. The falseness and unrealness are removed by the negation process. Thus, the ultimate cup, the "emptied" cup, cannot be false or unreal. By negation, we move closer to reality, not farther away from it. But you refer to "phenomena [that] are only ultimately false/unreal"! Whaddaya think? Is that a valid argument? editted extensively. sry groping for clarity. We have discussed this in length several times already. The Mahayana phrase is; "All things in the three periods of time (past, present, and future) are created by mind alone". So it cannot be nihilism, but at the same time we are still not claiming that false and unreal objects are not precisely that- illusions. I'm just using the standard terminology of Madhyamaka here. In this system, there are what are termed the two truths. Conventional truth and Ultimate truth. The first just means perceiving reality through the veils of ignorance like the average Joe perceives, and the second means knowing reality as it is, free of elaborations and beyond the extremes of 1. existing, 2. not existing, 3. both existing and not existing, and 4. neither existing nor not existing, which corresponds to the wisdom of bodhisattvas while in equipoise and buddhas all the time. But let's not get into ultimate truth quite yet. Now, like I said, conventional truth here is nothing more than the way the average Joe perceives things. He sees a cup, he considers it a cup. He sees other seemingly solid, truly existing things and considers them as such. And so on. This is conventional reality because there's nothing unconventional about our perception of it. It is also conventional in that we humans generally agree on the convention of labels we rely on which gives our experience reference points and order and makes sense of things for us. Lastly, in terms of conventional truth, there are valid and invalid cognitions or perceptions. Valid cognitions are termed such because, due to adequate causes and conditions, they always hold true from the conventional point of view. For instance, when in one's right mind one will always perceive water as wet, fire as hot, matter as solid. There's no nihilistic argument that nothing exists in any way as if there were only the mere vacuity of space and none of us or the objects we perceive, or that nothing reliably performs a function while it's not yet fallen prey to impermanence. Then, invalid cognitions are perceptions of things that cannot even be found by ordinary people, such as the famous Jackelope of Wyoming, or pigs with wings, and so on. Those cognitions are either imagination or pure lunacy. They don't hold true on the ordinary level of cognition or the ultimate level of primordial wisdom. Lastly, we can refer to things as only ultimately false or unreal because, in the example of a cup, it doesn't fool us into thinking it will hold some tea for us and then fail to hold the tea we pour into it, right? As long as it's not yet fallen prey to its impermanence, it functions perfectly. So, it is not deceptive in that way. It is only deceptive in leading us to believe it inherently exists as a cup. But if you pour out the tea and smash the cup into many pieces, where's the cup? The pieces bears no resemblance to a cup nor do they fulfill its cup functions, so where's the basis for calling the pieces a cup? Is there a cup in each of those little pieces? If so, why do we then call them pieces and not "cup?" Then, one can similarly break down the substance the cup was made of, and the smaller particles that make up that substance, and so on and never find anything that is solid, static, unchanging. One one will certainly not find any truly existing, immutable particles, much less clay or cups. So, to sum this up, while still intact, objects like cups are validly perceived and they perform their functions without deceit, yet they cannot be found to be truly, ultimately existing and so they're false on the ultimate level. Does this make more sense? just to add my walnut to the equation... it seems to me that it can be argued any way you want it. what you want is the carrot. the donkey of reason follows the carrot. so you could argue affirming negation, non affirming negation or affirming affirmation. you can argue one hundred levels of existence, or simply illusion. that it is all in the mind, or that objects exist inherently... however, whatever your logic, one cannot escape the anti logic of 'emptiness is form' 'form is emptiness.' whether or not you use dependent origination as a logical argument for emptiness does not matter. emptiness is. or is not, whatever way you 'want' to put it, such is the nature of mind. different subjects different objects, or abscence thereof. You are saying that from the viewpoint of emptiness, the conventional cup appears false. Therefore the cup is ultimately false. I am also saying that from the viewpoint of emptiness, the conventional cup appears false. So I abandon that, and consider the "emptied" cup as the real version, in the ultimate sense. And I conclude the cup is ultimately true. If you do not find the above completely mind boggling, I'd be surprised. Neither of us is actually disagreeing with the other about anything, or saying anything untrue, there is just a subtle difference in the ways we are using language. The lesson for me here is that speaking about Dharma is much harder than it looks, and suddenly a reason for the pedantic, repetitive forms of many sutras becomes evident. Perhaps they were done that way just in order to avoid linguistic traps. So this isn't a discussion about Dharma after all, since we agree on the ways things are. It's a discussion about the logically consistent way to label some bits of Dharma! So having mopped up that little mess, (I think) perhaps we should go back and review the thread. I find on re-reading the thread there have been issues raised by Karma that seem to have gone unanswered, and in some cases I don't even understand the questions. One thing seems clear to me though. And it isn't going to be popular. If you apply the standard tests of valid cognition to Chenrezig, that cognition will fail every single test, as has been pointed out already. All that being said, my desktop wallpaper is a Chenrezig/Avalokiteshevara thangka and it pleases me greatly. It reminds me of the compassionate aspect of Buddha, the warm caring human side, which I so often forget about in the pursuit of analysis. I recite his mantra, and sometimes those of Green Tara, Amitabha and others as reflections on aspects of Buddha's nature. Oh and my screensaver scrolls the Tara mantra across the screen. In green print too! Pema Rigdzin wrote: As long as it's not yet fallen prey to its impermanence, it functions perfectly. So, it is not deceptive in that way. It is only deceptive in leading us to believe it inherently exists as a cup. But if you pour out the tea and smash the cup into many pieces, where's the cup? The pieces bears no resemblance to a cup nor do they fulfill its cup functions, so where's the basis for calling the pieces a cup? Is there a cup in each of those little pieces? If so, why do we then call them pieces and not "cup?" Then, one can similarly break down the substance the cup was made of, and the smaller particles that make up that substance, and so on and never find anything that is solid, static, unchanging. This is just emptying the concept of a cup, which is the skandha of thought. But not emptying the form skandha itself. Whether intact or broken into pieces, on what do we base the existence of such form? The only possible way is through seeing, hearing, smelling, tasting, touching, or thinking. However, if we take each of these in turn we can see how they are all completely arising within consciousness, and in no way are they external to consciousness- as in an objective reality. Our entire experience is subjective feeling only. For example, eyes only see color. Color is the language created by eye-consciousness when light reflects into the eye and the consciousness is working properly. The rays of light are then translated into color, which is completely subjective. It may be different depending on one's karma. For example, those who are "color blind" see differently. Which one sees truth? Human eye, dog eye? Color is not an external object. Neither is sound, scent, flavor, sensation, or thought. So, based on just what are we claiming a form skandha of any kind? It is explained very clearly in the Shurangama Sutra. Ironically, this is said to be the first Sutra to disappear in the Dharma-ending Age. This seems to be due to the fact that it is so clear, and we simply cannot let go of the unreality of the external world we create through false thinking consciousness. It seems SO real. While the Shurangama Sutra says in Chapter 9; "Contemplating the cause of the form skandha, one sees that false thoughts of solidity are its source." Still, it is much easier to take other Sutras that have statements that can be easily used to say what we want them to say. Such as "form is emptiness, emptiness is form". "not existing in the way we think it does". Last edited by Pema Rigdzin on Sun Feb 28, 2010 9:09 am, edited 1 time in total.